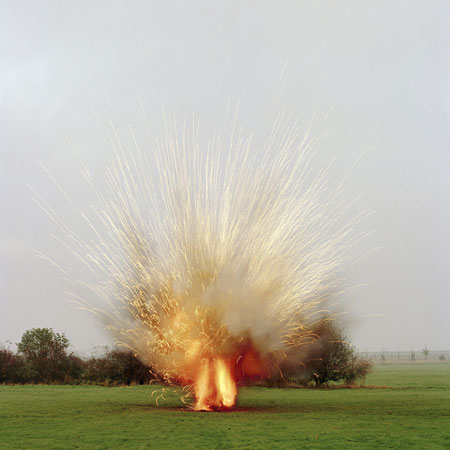 In her most recent series, Explosions, Pickering photographs the pyrotechnic displays used to train members of the British Army and the British police. These are not actual explosions, but recreations of how actual explosions appear; they’re intended to make training exercises more realistic. 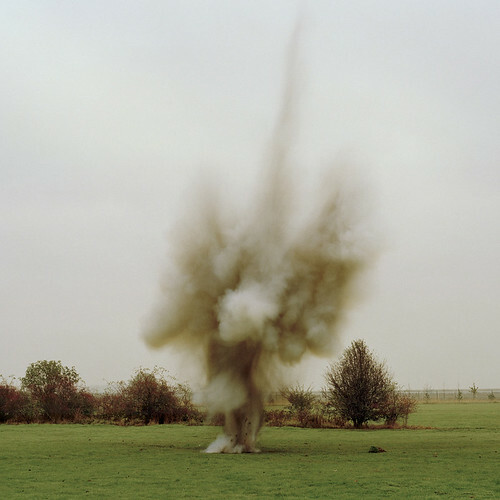 These photographs grew out of her earlier series, Public Order, in which she photographed the simulated ‘towns’ created for military/police training. There is an air of unreality to the photos in this series. Part of that is due, I suspect, to the innocuous English landscape in which the explosions take place. The contrast between the violent explosion and the placid countryside is discordant. The unreality is, I think, enhanced by the fact that the explosions themselves seem rather diminutive. They’re just not very convincing as explosions. That’s because we’ve all been conditioned by the hyper-unrealistic and spectacular blasts we see on television and in the movies. Real detonations tend to be much less visually dramatic (and, therefore, faux explosions meant to simulate real one are also less dramatic). This is clearly art, although it may not be art that everybody appreciates. There is a strange playfulness to the images, something that appeals to everybody who enjoys a big bang and a bright flash. Pickering says, "I really enjoy photographing the explosions…. It’s not only the effects themselves, but the people and situations around the production of the pyrotechnics that are interesting." The resulting images are somehow both compelling and underwhelming. This isn’t Hollywood; it’s a sort of counterfeit Hollywood…which is a concept that, if thought about too much, will probably cause your head to explode.